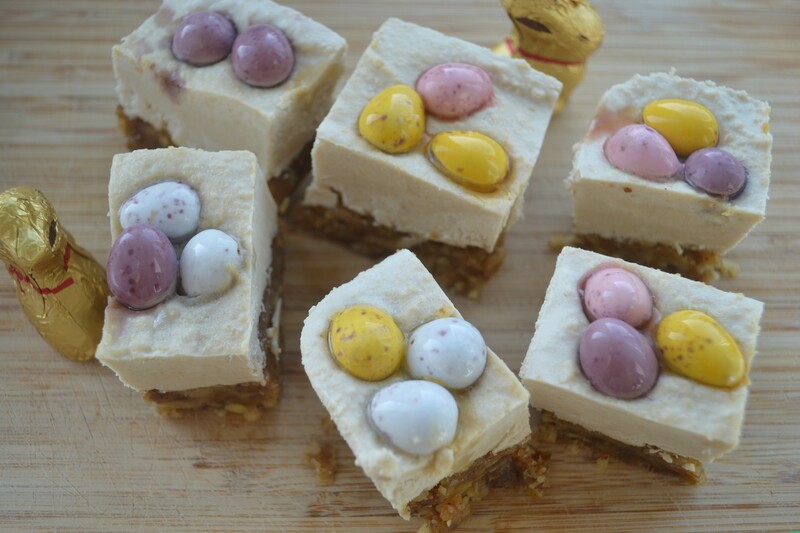 With Easter around the corner we will be supplying you with some tasty treats to enjoy like these delicious Vegan Cheesecake Bites! 250g cashew nuts, soaked for 20 mins in water. 1. Add the walnuts to a food processor, and blend until fine. Next add the pitted dates, maca powder and peanut butter. Try and maintain a ‘biscuity’ texture and add water if needed to ensure the mixture sticks together. 2. Remove this mixture from food processor and set aside. 3. Clean the food processor to make the cheesecake topping. 4. Add the cashews, coconut cream, agave, vanilla to the food processor and blend until it resembles a creamy ‘cheesecake like’ texture. Set aside. 5. Lightly grease a cake tin with coconut oil or dairy free spread. Add the walnut and date biscuit base along the bottom of the tin evenly. 6. Next add the cheesecake mixture on top evenly. You can add toppings of your choice: Mini Easter eggs, vegan treats, blueberries or desiccated coconut for example. 7. Freeze for a couple of hours, then cut and serve, being careful when removing from the cake tin.